Today was the day that we have been waiting ALL year every year. The day we would be racing in the Brompton World Championships 2015. This would be our 4th World Championship and we still get goose bumps EVERY year. As always I had been tirelessly preparing BBB for his big day. Making sure he was clean, stripes straight and buzzing. I took everything I dared to get him as light as possible, well thats abit of a lie. 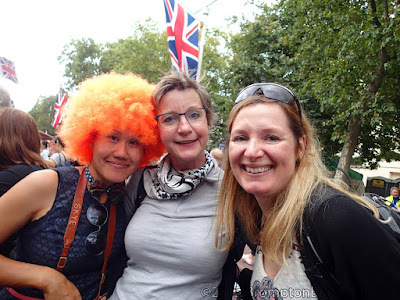 I could have taken off the mudguards and changed the tires to Kojak but this time I truly there to have fun and enjoy the atmosphere of the whole experience. As we made our way to Central London I could feel a buzz in the air, something was different. 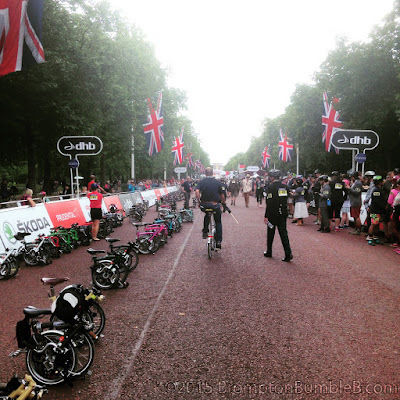 I wasn't driving a long way to get to the worlds but just a short ride in my home town, London. 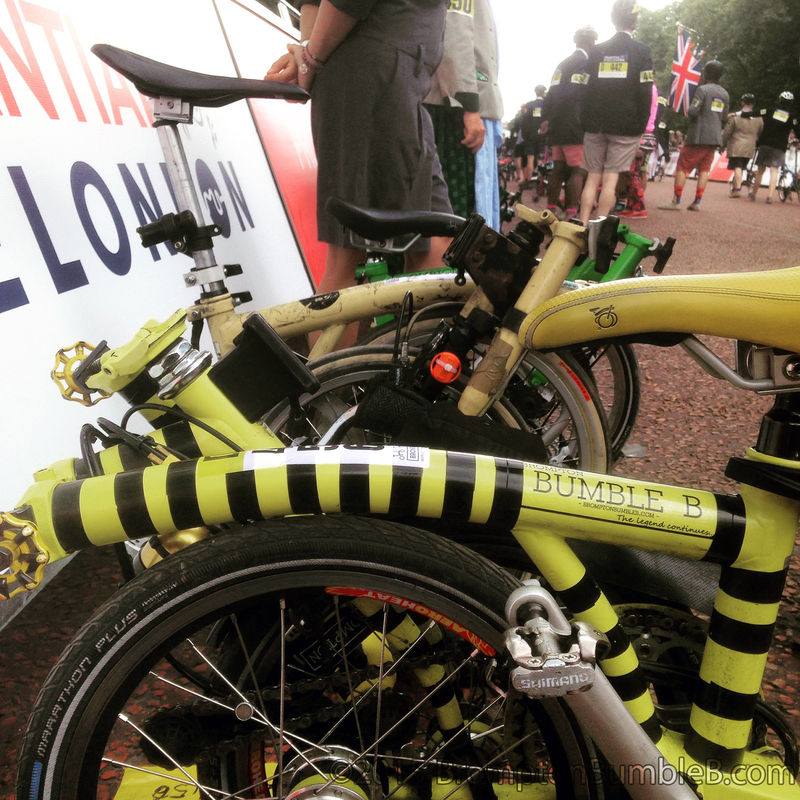 Upon arriving at the entrance to the Brompton enclosure I was greeted by many admirers of BumbleB. I actually found it hard to get registered cause everyone wanted to say hello to us and of course wanted to take a few photos and I hadn't even got the legendary jacket out yet. First things first was getting BumbleB chipped and settled in the Brompton paddock. 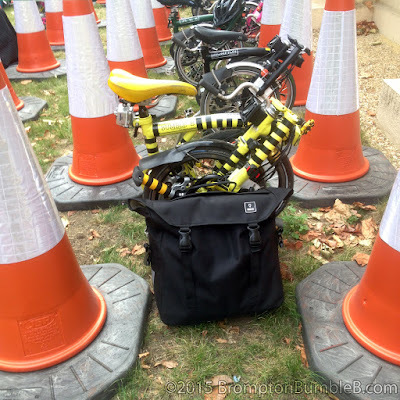 I did a quick check of the security and was happy with the arrangements of the Brompton staff looking after all these Bromptons. Well personally I would have added fully armed guards, electric fences & guard dogs but I guess the budget couldn't stretch that far. 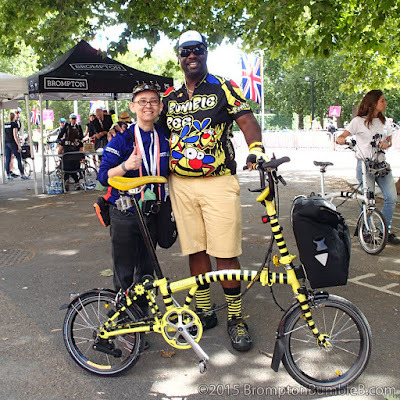 We started to explore the Brompton Pit and bumped into Kris HM Gomeze, Owner/Publisher of a great online magazine Bicycles United in based Thailand. I know we have a big readership especially in the far east it wasn't til now that it really hit how big. It wasn't long before lots of fans of this little blog came up wanting to say hello and have photo with me and the legend. 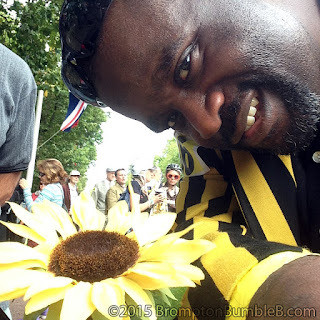 Many of them have said as soon as their friends knew they where coming to London, England that they had to get a photo with BumbleB. 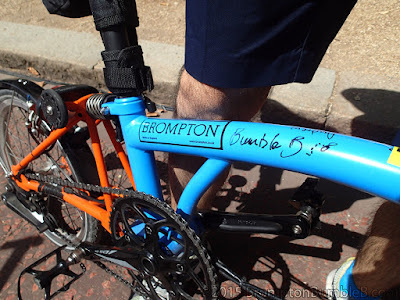 A very excited reader of my blog wanted me to sign his Brompton. Yes I kid you not. When I was signing his Brompton I noticed that Andrew Ritchie's signature, the founder & inventor of Brompton Bicycles was also on his bike. What can I say. I was almost overwhelmed by this. Walking around I managed to find a few familiar faces from various other cycling groups that I ride with. Food was excellent as always, so much so that I was so excited I couldn't finish my meal. Wondering around I was strangely drawn to this Brompton which had a basket full of sunflowers in. Weird I just couldn't help myself. Meeting and greeting so many people was very overwhelming & it just gets bigger and bigger every year. I swear I met a few thousand people all from different parts of the world & it was great meeting you all. Time almost flew past and it was time to get BBB and head to the start grid. There was 4 sections to the grid, as all 500+ riders couldn't start off at the same time we where divided into 4 sections, A though D. We was in the D section the last and riders thought to take the longest to do the 8 mile distance. 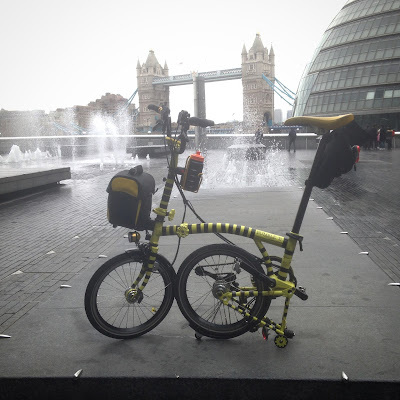 Later on I found out that the Brompton I was next to was an mark 2 edition, pretty rare and very sought after. 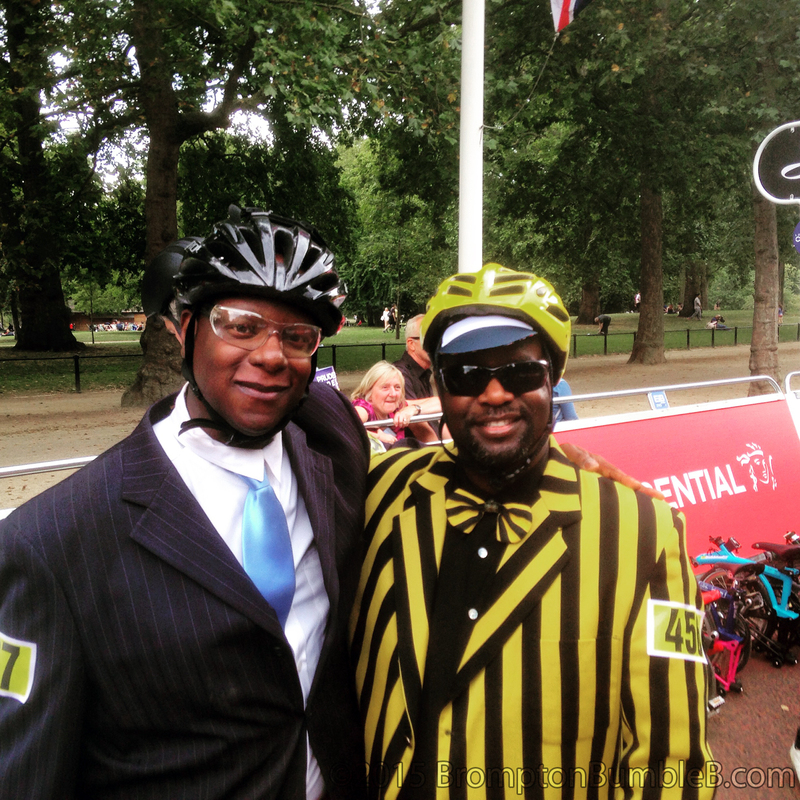 We had alittle time to kill so I went looking at for other riders and caught up with Newton Gooner Dixon Jr who flew over from the USA to be in London just for the BWC. I just had to get a photo of us together in all our BWC glory. As always it was a honor riding with you brother & hopefully again real soon. Riders milling around as we waited for our official start time of 17:00hrs. The nervous where starting to build a little as announcements and interviews with the top riders on how they think they would be doing in the race. 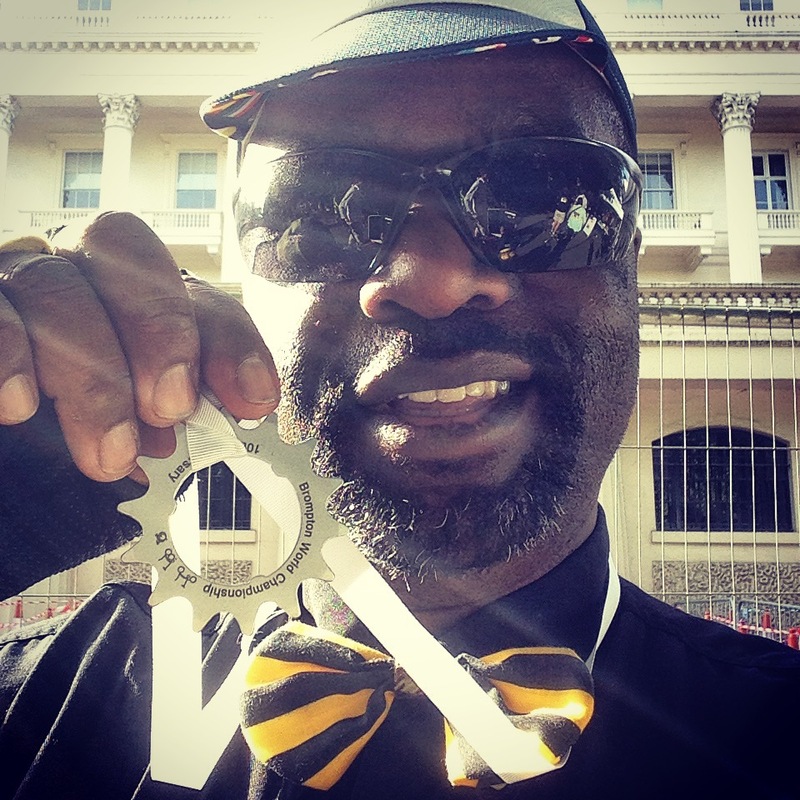 It was time for me to relax, focus on breathing and get my "Game Face" on. 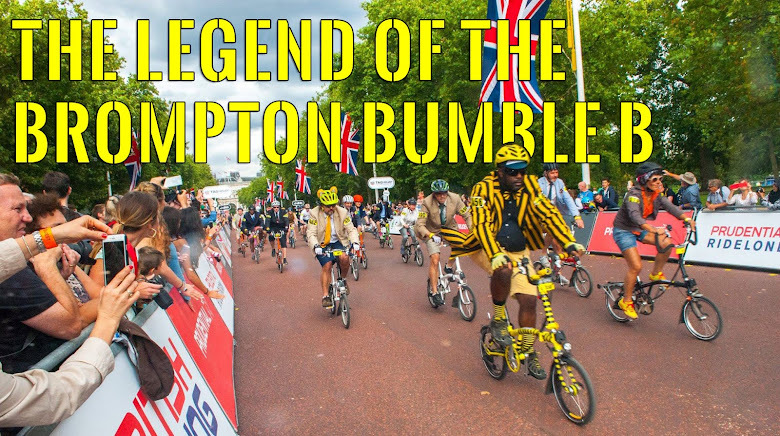 Finally it was the final minute, then seconds and then the 10th Brompton World Championships had begun. Being in group D met that we had to wait another 40 seconds as each group where separated with a 10 second delay to make sure there wasn't a huge bundle with everyone unfolding and trying to get ahead of everyone. 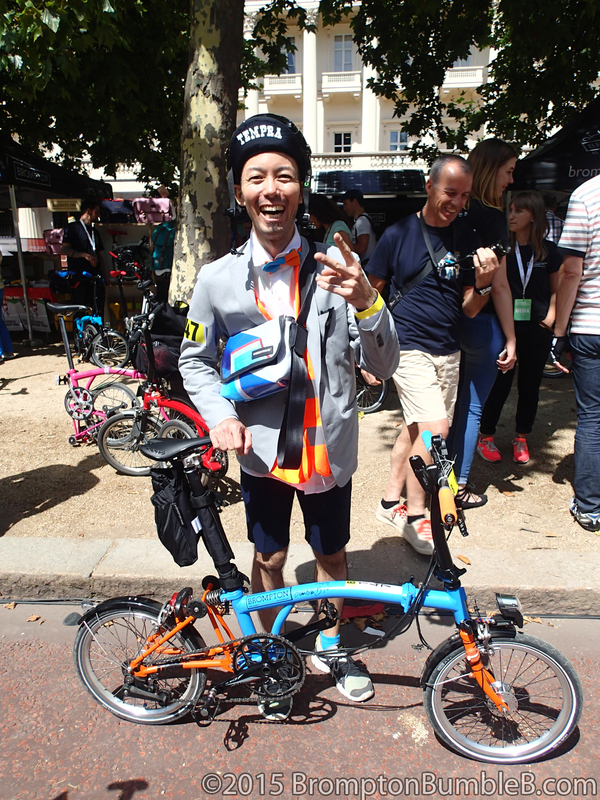 As I completed my unfold I realised I was boxed in by the riders around me, a flash of anger at myself for not realizing this at the beginning. I could almost hear my what my cycling partner Mr. Orange would have said in a situation like this would have been "Oh dash it all, excuse me kind sir, would you mind allowing me to pass!" 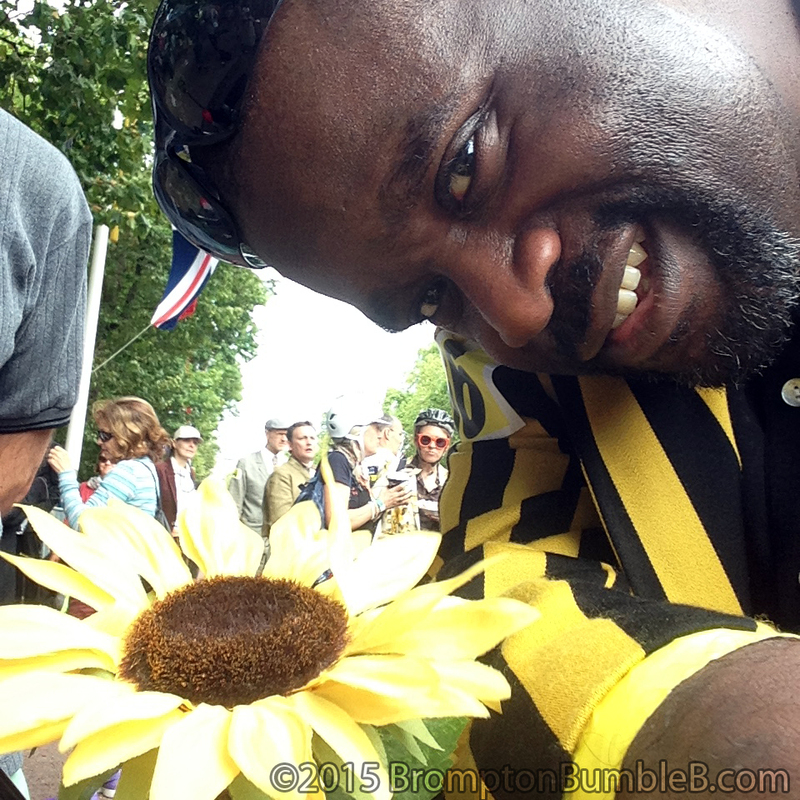 But ever the gentleman I calmly wiggled BBB out of harms way and headed down The Mall towards Buckingham Palace. What a backdrop, racing in the capital maybe in front of the members royal family themselves. The first couple of laps I was just enjoying the crowd screaming, cheering on the riders and many a time I heard "Go BumbleB" or "Buzzzz" as we went round. I did recognize a few of the voices in the crowd from people I have ridden with in the past and I couldn't help but smile & sometimes wave the whole way. The thing I also noticed was that with this being on road the surface was pretty rough in places and a few potholes here and there too. With the tires are race pressures everything was rattling. I was worried I would loose a filling in some parts. I had almost forgotten this was a race of 8 laps and had forgotten to focus on my breathing & keeping my legs going at a decent cadence. I knew I wouldn't be able to completely the official 8 laps in this Criterium style format. Basically the first rider to finish the 8 laps was declared the winner and no matter how many laps you had done the next time you came up to the finish line that was the end of the race. I knew I probably wouldn't be able to do the full 8 laps as the circuit being pretty much flat the whole way round was going to be VERY fast. Not sure which lap it was but there was a pretty bad crash I came across while exiting a very tight right hand turn by Horseguards Parade that happened about a 30 seconds before I got there. First Aid & marshals where on the scene with in seconds and tending the single female rider & guiding the riders around. Enquiringly later I found out that she was basically unharmed in the incident. I could feel the wind as the much faster riders flew past me and kept out of the way as best I could, a few managed to shout words of encouragement to me as they flew past. On my 5th lap I heard a familiar voice & a flash of orange "Come on Andrew" was my cycling partner would was really powering away with some speed and always makes it look so easy and effortless. I could hear from the commentator over the loud speaker that the lead riders where on starting their final lap so I knew I would be able to get 6 laps in for sure. Abit disappointing as I wanted to get 7 laps in but the course was EXTREMELY fast. 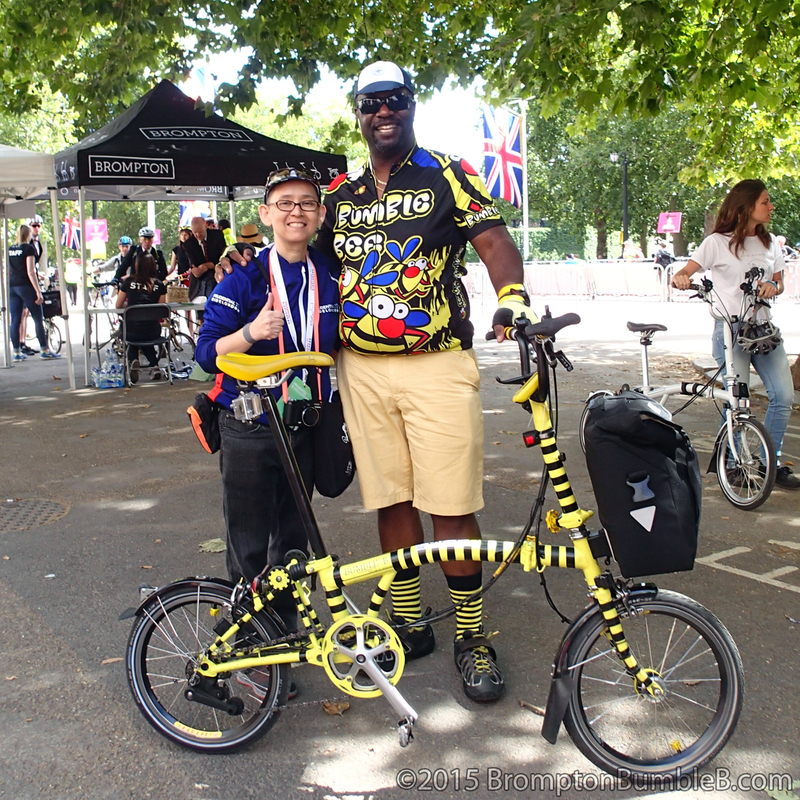 Then it was over, my 4th Brompton World Championships was over and done with. As all the riders slowed down to be ushered into the riders area to pick up their medals and much needed bottled of water and recover from the race. After the race it was time for food and drink. 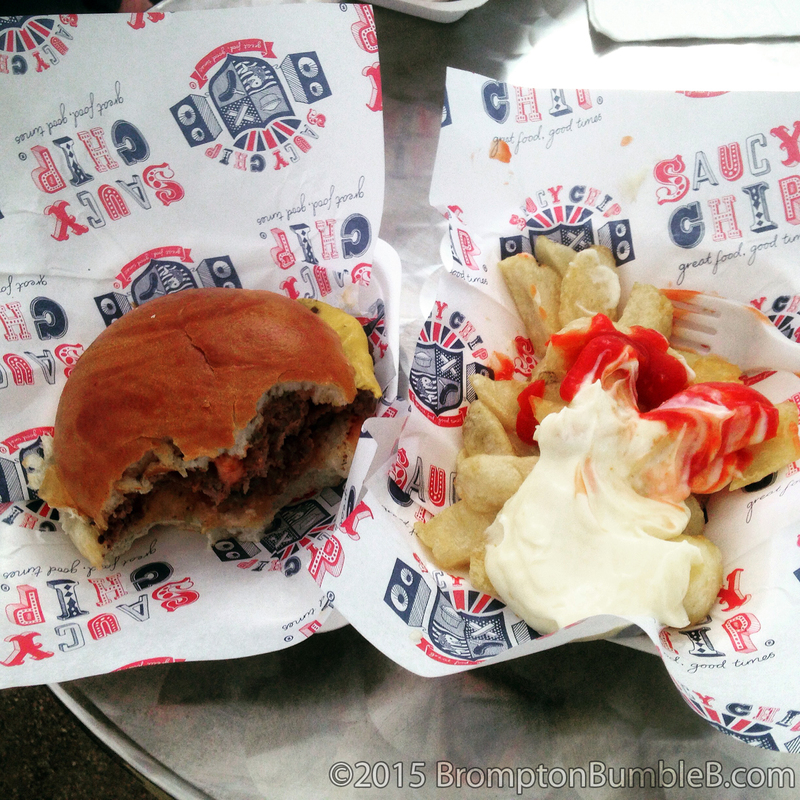 Brompton as always put on a damn good spread. A MASSIVE vegetable & chicken paella which was very tasty. You could also get beer, gin & tonic & other drinks too. Not long afterwards news began to tickle though that the results where in. Well done to everyone that took part and hope you all had a great day I know I sure did. 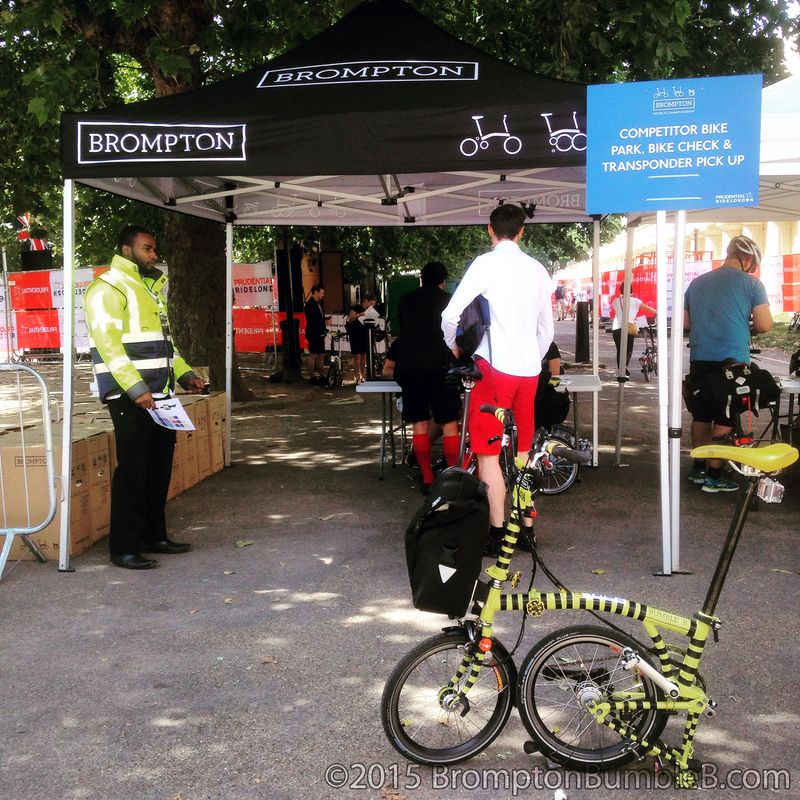 Brompton once again have done a pretty good job with their World Championships. I was planning on doing the Brompton Urban Challenge earlier on in the day but with the Prudential Ride going on it took me a good long while to get to the Brompton Pits to sign up cause of the crowded roads. Will make sure I just do the BWC only next year if there is more than one event going on the same day and make sure I go there directly instead of going with the feeder ride from my local area as this was quiet slow with a big group of new inexperienced riders & many toilet breaks and regrouping. 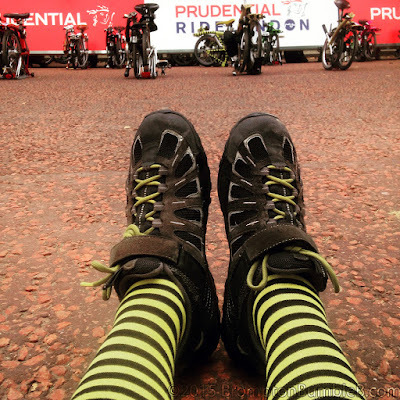 Our thoughts are already turning to Brompton World Championship 2016 and what would I change? 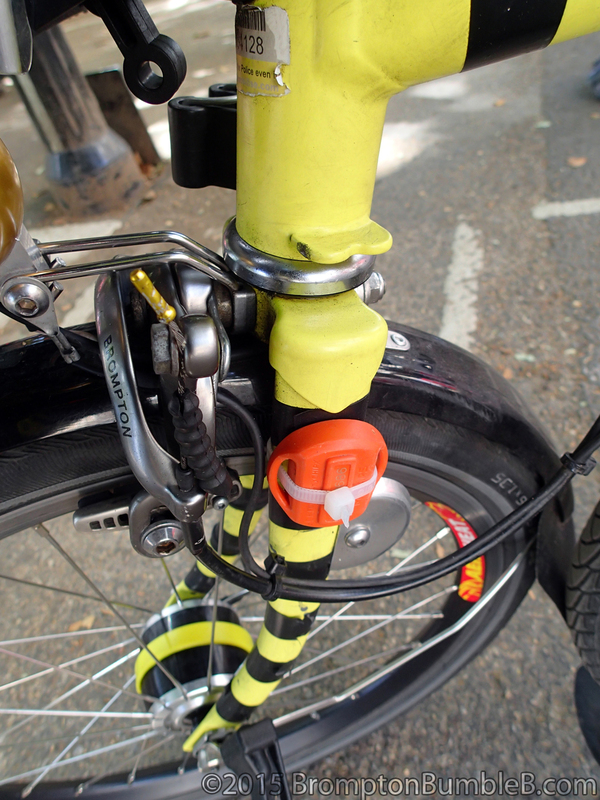 Change BBB's gearing if the location is going to be flat. Well that's it, the Brompton World Championship 2015 is all over and done with. I feel kinda sad as I have been focusing and looking forward to it for months. 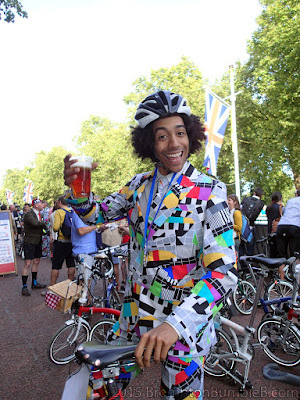 But then again I still have other events & London Brompton Club rides coming up so its all good.